UPDATE: Froghut's Deck Editor is now officially part of Tabletop Simulator for all Windows users. You can find this in the modding folder in Steam Library > steamapps > common > Tabletop Simulator > Modding. It can load deck save's from Anrew's tool and saves in the same format. Many thanks to Andrew for creating his Deck Building Tool that gave me the basis on which to base my tool! Since this is the first version there could still be bugs, so I'm looking forward to bug reports, suggestions and feedback! Last edited by Froghut; 11-02-2015 at 03:29 PM. Just downloaded it and tried to open some of my existing deck files without much luck. The only thing slightly unusual about my decks is the size which run over the recommended 5000 X 5000 pixel size before I resize for export. The image is of the worst offender in this regard whilst the other are only a little larger than 5000 X 5000. Scratching my head at the moment chief ..... any suggestions ? Can you open the decks in Andrew's Deck Builder Tool? The only thing I can think of right now might be that the image files the deck tries to load no longer exist? I will build a debug version that logs stuff to get to the bottom of this. Edit: Uploaded 1.0-test, it will create a log.txt next to the .exe containing image load errors, it would be nice if you could send that to me or post it here. Files all open fine in the other deck builder. I even opened an old deck in Andrews version. then saved it again to my desktop as a .tsdb file with a different name. Then attempted to open this newly created file in your Deck tool with the same result I'm afraid. no cards visible. + The scroll wheel is remarkably easier to use than the manual zoom in and out the other deck builder had, where the zoom had to be selected from a menu. + Also I like that the deck builder doesn't need added allocated memory to save bigger decks. + Easy drag and drop feature is nice. Dragging multiple files in works and successfully slots them in side by side. + Max Deck Size setting saves between runs without any extra files. - When dropping in cards and zooming in and out using the mousewheel, black bars seem to inexplicably appear to the left of some of the cards. All the cards are the same dimensions so I have no idea what is causing this. The resulting image isn't affected though. - "Max Deck Size" in the Export menu should be toggleable and turned off by default. - Exporting the file as a .png doesn't make the black background transparent. O.K a few things to report. Loading one of these original .tsdb deck files into your deck tool doesn't generate a .txt log file at all. However loading jpg images into a new deck using your tool does generate a log file which it adds to as more images are added but does not add to when trying to reload one of my existing files. also a .tsdb deck file created with your tool cannot be opened in the older deck editor that I use. (gives a "Could not load deck(file is probably corrupt)." error message. @Mark: I'll investigate the black bars, I'll try with a few more different card images. I'll add a checkbox to the max deck size thing, thanks for the suggestion. And what do you mean, should the background where no cards are be transparent? @Lucky Seven: I'm using "TSDB 2.2.1" which I got from the nexus mods website. I actually haven't tried opening a save from my tool in TSDB, I'll check that out. Perhaps you could send me a .tsdb file so I can check if there are any things in your file(s) that I missedi n mine? @Lucky Seven: I'm using "TSDB 2.2.1" which I got from the nexus mods website. one of my TSDB files. Cheers for the speedy update. V 1.1.1 fixes the black bars between cards, also I forgot to mention you can "scroll" around by holding down middle mouse button instead of using the scroll bars. I just finished version 1.3 of my TTS Deck Editor tool. After shifting a card to the end of the deck, it would be nice if the rest of the cards automatically moved to the left to fill in the gap. I could also just re-import the cards without the white card and then import the white card last of all, though I shouldn't need to. Still needs to be a way to change the background image from black to another colour, it's inconvenient if you're using black cards. The numbers on the empty slots should be optional. If you can, invert the colour of the background image and use that for the colour of the numbers. That way you shouldn't have any readability issues. The reason I wanted transparency for .PNGs is for purposes outside of TTS, for when I want to print the deck out. Right now I'm having to edit that out manually. I would also like a Print option in-program for the decks to save me time, though it's not critical. Last edited by Mark; 10-16-2015 at 08:52 AM. Moving cards to fill the spot when moving a card to the end of the deck will make it into the next version multi selection of cards is on the agenda but not that easy so it might take a bit more time. I totally forgot about the background color, I will put that in too, also the option to disable the numbers. As for the printing, I'll have a look at it but don't know yet how much work it will be, so depending on that it might also make it into the next version. Last edited by Lucky seven; 10-18-2015 at 08:25 PM. Yep, I actually was meaning to. Thanks for the reminder. - Moving a card to the last spot will move all following cards up to fill that slot. - Background color can be changed (including transparency). - Numbers on free slots can be disabled. - Added a print menu entry. - Imgur account/album can now be used instead of only anonymous upload. 1.3.2 is up, this version supports Google Drive upload and multiselection of cards. Edit: 1.3.3 is up, contains bugfixes for multiselection. Last edited by Froghut; 10-21-2015 at 05:12 PM. Guide tool - You can put a template below (eg the image of the original deck) to place over the new translated cards in the same order. So you can modify the image so you do not confuse (change the brightness and contrast, or to become grays) and use it as background reference, loading it into the editor. Hm, I'm not sure I understand what you mean. Do you mean basically loading an exported deck to put in as a background in the deck editor? So instead of having a background color you would have a background image? But then I don't understand how that would help with brightness/contrast etc.. I'll try to explain. You need to replace a deck of cards from one language to another language. 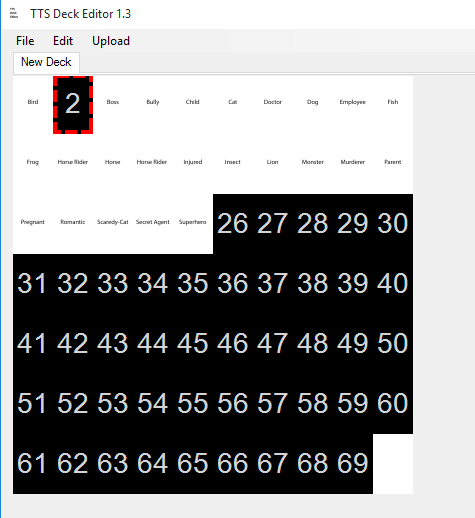 Open deck editor, load the original card deck as a background image. You are placing each new card in another language over the original card that corresponds to the deck. So you respect the decks created and duplicate cards that were created in the mod. To avoid confuse you while you put new cards on the original. The image of the original cards deck should have a tone or something different to the new translated cards (eg altered the brightness and contrast, or a color filter, etc ...) Otherwise, being the same but with text cards changed, would it take to know how many more you have already replaced and how many you have left to replace. Pero esto último es secundario (puede hacerse manualmente). En principio sería de gran ayuda poder cargar la imágen del mazo de cartas que quiero sustituir, como imagen de fondo. Also added cubeupload to upload providers.